L’armée dominicaine voit le jour en 1880; aucun casque n’est alors porté par cette troupe. De novembre 1916 à septembre 19241, le pays – dont l’armée compte alors seulement 900 hommes – est occupé par les États-Unis (USMC). Les seuls casques présents sont les rares M1917-A1 des Américains. Une Domenican Constabulary Guard (DCG) (forte de 2000 hommes, créée à l’initiative des occupants et qui vient remplacer l’armée dissoute, est la seule formation armée autochtone. Ces hommes ne portent pas de casques. 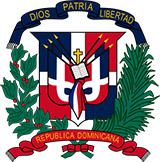 En 1921, une Académie militaire est établie à Haina, à 30 km de la capitale et, en 1928, la DCG est transformée Domenican National Army – Ejercito Nacional Dominicano. Toujours pas de casques. Quelques US M1917-A1Durant cette période, il est possible que quelques casques américains (M1917-A1 puis M1) aient été utilisés, n’ayant pas pu visiter le Musée d’histoire et de géographie de la capitale, je n’en ai pas la preuve. 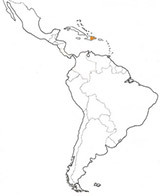 Sharing with Haiti the Caribbean island of Hispaniola, the Dominican Republic created its own army in 1880 under the presidency of Gregorio Luperon. Considered as an operetta Army and modestly numbering 900 men, no helmets were issued to its troops. From 1916 to 1924 US Marines occupied the country to help bring order to a population racked with political instability and economic chaos. At the departure of US forces, order had been established generally, the small army had been dissolved, and the Dominican Constabulary Guard (DCG), numbering 2000 men, had been created. 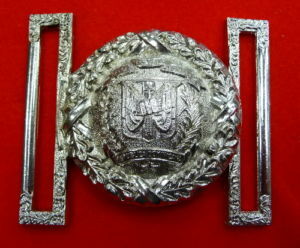 In 1921 a military academy was founded, and in 1928 a national police force was established but was soon transformed into the Ejercito Nacional Domenicano (the Army of the Dominican Republic), which replaced the DCG. Apparently, even at this late stage no helmets were worn by any members of the armed forces. In 1930 the dictator, Rafael Trujillo, took control of the country. He immediately created the brutal Guardia Presidencial (Presidential Guard) under his direct control. Some M1917-A1 helmets were likely used by this force in the years following the Second World War. In the 1950s the abuses of this nearby dictatorship seriously strained relations with Washington. In this context, Trujillo, eager to militarize the country and modernize his 10,000-man army, decided to adopt a new style of military dress and equipment. With regard to helmets, he imported the German model M35. The only Stahlhelm type models avail-able at that time were those used by the German Frontier Police (Bundesgrenzschutz). It was these models, manufactured by Linnemann-Schneztler, that were introduced into some elite units of the Dominican armed forces. The suspension of this helmet is based on a circular-shaped, foam rubber cushion, which is affixed to the interior of the steel shell. The liner itself is the M35-type and is made of leather. For land forces the color is beige-brown and for the navy, light-blue. The front of the Air Force helmet is decorated with a large tricolor national cockade. These beige-brown helmets were issued to the guards of the infamous San Isidoro Bar-racks. After the assassination of Trujillo in 1961, the German fashion disappeared, and following a thawing of the relations with Washington, the US M1 was introduced. These helmets were normally not decorated with any particular emblem. Toward the end of the 1980s, the army saw the introduction of a number of PASGT, probably of American manufacture. These are standard equipment in the Dominican armed forces, which now numbers 15,000. Simultaneously, dark plastic US M1 clones of unknown origin were introduced for ceremonial duties. This type of helmet is currently worn by the honor guard at the National Mausoleum.